Fascia like other soft tissues has variable degree of elasticity that allow it to withstand deformation when forces and pressure are applied as it can recover and return to its starting shape and size .It respond to load , compression and force as at the begining of loading fascia fascia has an elastic response in which a degree of slack is taken up .Over time, if loading persists in a slow and sustained manner, creep develops, which is a slow, delayed yet continuous deformation. After that , an actual volume change occurs as water is forced from the tissue .When loading ceases fascia return to its original shape .The restoration of shape occurs through elastic recoil via hysteresis, (which is the process of energy use and loss in which tissues are loaded and unloaded) .The time needed for tissue to return to normal via elastic recoil depends on the uptake of water by the tissue and whether its elastic potential has been exceeded. This called a binding down of fascia . The following videos provide additional information regarding fascia and can be viewed on the YouTube channel "Integral Anatomy." Defining the Morphology and Distribution of the Alar Fascia: A Sheet Plastination Investigation. ↑ 1.0 1.1 1.2 Fascia. Wikipedia, the free encyclopedia. 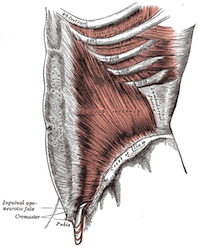 http://en.wikipedia.org/wiki/Fascia (last accessed 13 Oct 2013). ↑ Ruth Duncan . Myofascial release (hands-on guide for therapists ) . 1st ed , 2014 . ↑ Ruth Duncan . Myofascial release (hands-on guide for therapists) . 1st ed, 2014.